If the big hair and heavy makeup haven’t given it away already, I just came from a shoot for a campaign that’ll be released soon. (Woot! Excited to share it with you!) As with all of my shoots, I came wearing a no muss, no fuss outfit to the studio to keep me comfortable. The thing with shoots is that you can never really know for sure how long they’ll go. Usually, there are plenty of changes and layouts that would require me to keep going back and forth the dressing room–which means, aside from comfortable clothes, light and easy footwear is essential. It’s a good thing my new Native Shoes x Pleats Please Issey Miyake flats are here to save the day. I’ve always loved how Native Shoes feel on my feet. They’re so cushiony soft and refreshing at the same time. I still remember the first time I wore Native Shoes. It was during my first ever Sinulog Festival experience in Cebu. I was searching for shoes that would be able to withstand the craziness that is Sinulog. What with all the walking, paint-throwing and water/alcohol splashing, it was no easy feat finding one that can take all of this. Luckily, I found out that Native Shoes are not only lightweight but waterproof, shock absorbent, washable and odor-resistant too! They’re like the superman of shoes, except they have no kryptonite. (I’m sounding a bit too nerdy, am I?) Fast-forward to now, I already have 6 pairs of these babies. All ready to take me through the toughest situations. They’re about to witness another crazy fun festival actually. I’ve already packed 2 of them with me to Bacolod’s Masskara. I’M SO EXCITED! It’ll be my first ever Masskara experience, thanks to Smart Postpaid and Deezer! I’ll be attending both the Masskara LoveDance on October 17 at Central District Football Field and Masskara Invasion on the following day at Lacson Street. If you’re itching to go to Masskara and enjoy these festivities as well, why don’t you join Smart Postpaid, Deezer and Skyscanner’s fly-out promo to Masskara? 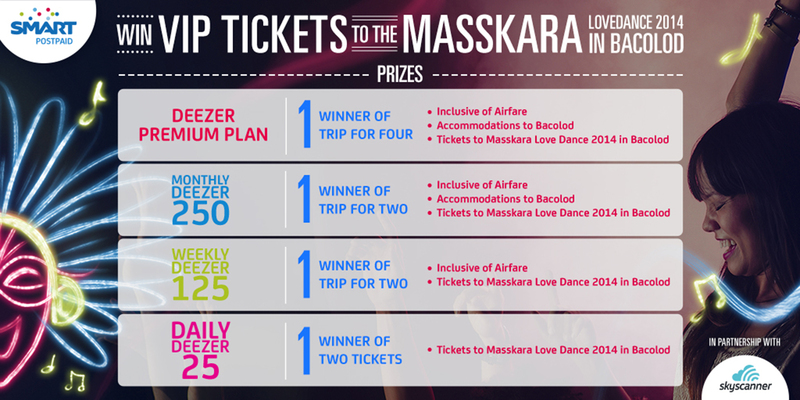 Subscribers who register to any Deezer Flexibundle or enroll to any Deezer Premium Plan will be automatically entered into the contest and earn raffle entries that just might win you free flights, accommodations and tickets to Masskara. There are different prizes up for grabs, depending on the Deezer bundle or Deezer Premium Plan you enroll to. I attached the poster below for your reference. (You’re welcome.) You can also visit the Smart Deezzer x Masskara website for more details. Promo period is only until September 30, 2014 so hurry! love your make up and your outfit. is this for facial care center campaign? so comfy :) love your shorts, is that from their spring collection po the one that Miranda Kerr wore? One of best outfits really like it! Hi camille you always come up with something new that is the most beautiful thing in you, which i like the most also. WATCHING you………yes!!! “watch” …i am always watching you not because only your style, “you are only you”. You are some one that anyone can desire to be like you. I always being inspired by you. Because with a great fashion sense you have a great personality it blooming on your face always. Love your hair and makeup here. It’s one of your best looks yet. You should wear this look more often, the makeup is amazing! Thanks Seryn! Wish I can do it! Haha! You look so different with smoky eyes and curly hair — very sultry and glamorous! Like a fashion vixen <3 Can't wait to see the full campaign soon. I heard that the Masskara festivities are always super fun! Nice casual outfit. I love your hair today and also your makeup. I recently discovered your blog and am so inspired by your fashion sense and the way you write. Your travel posts are so detailed! I really admire the effort you put into each post! Haha! Calling Smart! I did hear about Dinagyang though. Maybe next year! :) I’ll write those food suggestions down! I have so many versions of these shorts haha!